Make Your Own Almond Bark Candy! I am making almond bark candy for the first time and I need some help. The actual "white almond bark" melts nicely and sets up. The other chocolates that websites give as good for almond bark do not set up; they melt and stay melted. I have melted bars of Ghiradelli, Lindt, and many others that websites said were good to use. 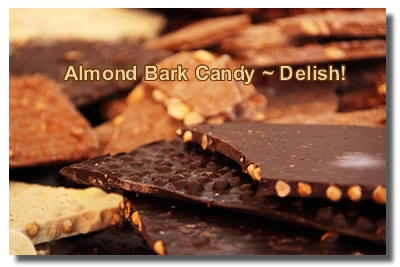 Nothing sets up except for the "white almond bark" or "chocolate flavored almond bark." I was trying to use better/richer chocolate. I can't imagine why Ina's chocolate sets up and mine stays melted. I have melted them per recipe instructions - either in the microwave or in a water bath. Are you referring to Ina Garten's almond bark candy recipe? You're right (or the other websites are right, however you want to look at it)! You should be able use just about any chocolate you want to make a delicious chocolate almond bark. I'm not sure why your chocolate isn't setting if you have done nothing to it beyond melting the chocolate. If the chocolate was set, and you gently melted it, it should set again when the temperature drops back down. it at all. Instead it has vegetable solids, which does make it set a little firmer. Have you tried refrigerating your almond bark once you've melted the chocolate, mixed in your chosen "filler" (nuts, dried fruit, pretzels, peppermint, popcorn, etc), and poured it out on the baking tray? I normally don't recommend refrigeration when it comes to chocolate, but in the case of your stubborn almond bark candy, you may want to make an exception. Refrigerate for about 30 minutes, then you can cut up the bark and store it in an airtight container in the fridge if you like. You may find that once you've removed it from the fridge after the initial chill, it will return to room temperature and be fine. If that's the case, you should still store the chocolate bark in an airtight container just to keep it fresh tasting till it's gone. The only other suggestion I could make for getting your high quality chocolate to set a bit better is to add a little of Crisco shortening to the chocolate when melting. You'd only need a teaspoon or two per pound. I hope this helps and that you can make some successful almond bark candy this holiday season. I love making chocolates for Christmas, but it is SO hard here in Australia because that is the hottest and most humid time of the year. :) NOT a good pairing with chocolate! I know EXACTLY what Carol means! Melt the chocolate with or without butter, make your bark, refrigerate it 30 min or so, remove it and lo and behold a little while later - soft putty! It was in the 60s inside the last time I tried, thinking it would help but no. If I leave it all just sit at room temp for a day, it will set up to where it can be handled but it is still a soft set. I used morsels and Bakers chunking it up. Followed the recipes - they make it sound so EASY! I use to make chocolate covered cherries, strawberries, cookies, pretzel rods - what happened? I am living in the same house, same environment. The companies said they did not change their ingredients. Is it too hot? or melted too fast? I, too, wanted to make my candy for a future event. HELP!!! At least I see I am not alone!! I believe you! $50 per pound makes me a real believer! :) I'd love to try that one day. It must be well worth the experience. With paraffin wax, you just add a small amount (about 1 ounce per pound of chocolate) to the chocolate while you are melting it. It will melt in and blend with whatever fat is in the chocolate. Believe it or not, chocolate is a very big deal in my little town in Hawaii. It is the home of the Original Hawaiian Chocolate Factory - the smallest chocolate maker in the U.S. Also, we have some nice chocolatiers. I am making this bark for gifts so I can't really keep it in my frig. My question is - How do the paraffin was beads work? Yes, the almond bark probably doesn't have cocoa butter in it, so it's setting up for you without the low melting point. Heat and humidity don't go well with chocolate. I live the tropics of Australia, so the seasons are the opposite of back home in the US. That means Christmas chocolates all have to be refrigerated or else they're a dreadful mess. I've never tried adding gelatin to chocolate, but it doesn't really sound like it would work. However, if you decide to give it a try, you'll need to use it as it is. What I mean is, usually to activate the gelatin you need to dissolve it in water or another liquid. Water will make the chocolate seize and make a real mess of it. Instead, maybe you'd rather try getting some food grade paraffin wax. If you melt a small amount of the wax in with the chocolate, it should cause it to set better. Another option is to get some Paramount Crystals here at Candyland Crafts. They are generally used to thin chocolate and make it easier to work with, but some people have said that they felt it made the chocolate set better for them. I meant I added dried fruits and nuts and believe me, I have packages of them so my Christmas gifts will now be my world-famous trail mix instead of almond bark. Since I live in Hawaii I must say I think you are on to something with the temperaure in my home which is a bit high - although the inexpensive white almond bark has no problem setting and snapping. In the melting process it is not getting too high. I have watched a dozen you-tube demonstrations and read a hundred recipes and the temperature is the only variant. Because I don't give up easily with anything I was wondering if gelatin would possibly work and may try a very small batch using gelatin. What do you think of gelatining the chocolate. By the way today I tried our Hawaiian Chocolate that costs about $50 a lb. and after 4 hours it does look like it might be setting. I'll let you know. Assuming that it isn't the temperature in your home (room temperature) that is too high, it sounds like maybe your chocolate is getting out of temper when you melt it. Most commercial chocolate bars (like Ghiradelli and Lindt) are tempered to give them that snap and shine. If you are careful when you melt them to not let the temperature get too high, the chocolate should hold it's temper. If it goes out of temper, the melting point changes and you do lose that fine finish. You want to melt the chocolate with the least amount of heat possible. I have to say, the white chocolate cranberry quick bread sounds super yummy! I hope they turn out perfect for you.